Many adults have incorporated dietary supplements into their daily routines as a means of incorporating more vitamins, minerals, or herbs into their diets. But despite their recent popularity, a recent study shows that these supplements may not be what consumers think they are. A team of researchers, led by Madhur Kumar of the California Department of Public Health Food and Drug Branch, recently uncovered that 776 supplements sold over the counter -- from 146 companies -- from 2007 through 2016 contained unapproved pharmaceutical ingredients. According to the National Center for Complementary and Integrative Health (NCCIH), Congress passed the Dietary Supplement Health and Education Act in 1994, classifying dietary supplements as food -- not drugs. 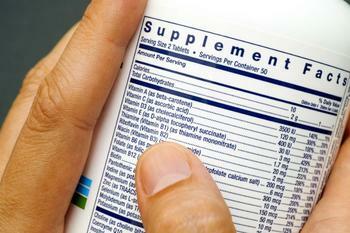 Because of this, the supplements weren’t subject to certain safety and effectiveness testings. This served as the precursor to the researchers’ study, in which they evaluated data from the Food and Drug Administration’s (FDA) Tainted Products Marketed as Dietary Supplements database from 2007 through 2016. In looking through the database, the researchers highlighted several key findings. The top three adulterated products were marketed for sexual enhancement (45.5 percent), weight loss (40.9 percent), and muscle building (11.9 percent). All 776 supplements contained unapproved drug ingredients, while 97.6 percent of cases didn’t even list the unapproved ingredients on the label. Overall, nearly 80 percent of all the supplements contained one unapproved drug ingredient, while over 20 percent contained more than one.. Despite the FDA’s power to recall supplements that have proven to be tainted, the agency did not mandate any of the adulterated products found in this study to be taken off the market. Dr. Pieter A. Cohen of Cambridge Health Alliance in Massachusetts commented on the study in an article that was recently published in JAMA. He believes that the only effective way to put an end to this issue is for policymakers to get involved and revamp the current laws. Dr. Cohen also pointed fingers at the FDA, calling their current system of removing and recalling certain drugs “cumbersome and time-consuming,” and believes that the agency has put consumers’ health at risk due to their inability to remove these products from stores.